The above print ad is available in jpg and PDF formats for weeks 1-4 of our Life After 40 campaign. Did you know at the end of week two, fertilization occurs and a unique, complete human being with 46 chromosomes detailing her entire development throughout life has entered the world? Chinese lawyer Chen Guangcheng has escaped from house arrest and released a video describing the brutal treatment he received. Chen was arrested for speaking out against forced abortions and sterilizations which occur because of China's one child policy. According to activist sources with knowledge of Chen's escape, it happened last Sunday. Chen had apparently planned his departure for weeks, pretending to be bedridden in hopes that those guarding his farmhouse would become less attentive. Hu said Chen had to climb over a high wall, which was especially difficult because Chen is blind. "His story is the Chinese version of the Shawshank Redemption," Hu said. Today, more than 825 Hispanic women will make the choice to abort their unborn child. Sadly, Hispanic women are having a disproportionate number of abortions. Hispanic and African-American women together total more than half of all the abortions in the United States. More than 302,500 unborn Hispanic babies die each year as a result of legalized abortion. Learn more about abortions and Hispanic women with the fact sheet below. A few weeks ago, twins Nicholas and Alexander Maybanks-Bolden were born at 25 weeks, a month after their mother Christine Bolden was declared brain dead. The next day, Bolden collapsed while walking out of a building in Grand Rapids with her 3-year-old son and boyfriend. Her family would never speak with her again. Doctors told relatives she had two brain aneurysms that burst, the apparent result of stress from pregnancy on a possible pre-existing health condition. Bolden was declared brain dead at Spectrum Health days later, on March 6 — the same date an obituary lists as the date of her death. But as family learned she was gone, they were hit with other news that brought on a wave of strongly conflicting emotions: Bolden's twins appeared to be just fine. She carried them for nearly a month, while on life support, until their birth by cesarean section April 5. Though the boys remain in the hospital — after being born premature at 25 weeks — family now say they are thanking God that a part of Christine Bolden will live on. On Tuesday, Michigan legislators on the Senate Judiciary Committee heard testimony on a package of pills which aims to outlaw women being coerced into abortions. The legislation passed the State House by votes of 72-37. After several women testified about their own experience being coerced into terminating a pregnancy, Jones, R-Grand Ledge, spoke about a 19-year-old female college student with an unplanned pregnancy. He said the father's parents brought the girl "into a restaurant and did everything they could to coerce this young lady into an abortion. Offers of money; offers of all kinds. She resisted that, got an attorney and got full custody of that baby." "She then stayed in college, became a great special education teacher and adopted two special needs children that nobody wanted. The baby in question that they wanted aborted was reading thick books like ‘Harry Potter' by age 6. At age 7 he tested at ninth-grade level, at age 12 at a college level. "He's my 14-year-old grandson." On April 21, 2012, Chuck Colson passed away. Colson was a prolife hero who often spoke at prolife events and whose writings often defended the right to life of unborn children. Here's a commentary by Colson which was published on May 19, 2011, in which he discusses the value of human life and Ronald Reagan's "Abortion and the Conscience of the Nation" booklet. Reagan reminded readers that neither the American people nor our legislators had ever had a chance to decide if they really wanted to legalize abortion through all nine months of pregnancy: That’s still true today. Nor is abortion a right guaranteed by the Constitution. Reagan wrote that Roe v. Wade was “not the first time our country has been divided by a Supreme Court decision that denied the value of certain human lives.” The Dred Scott decision affirming slavery has that dubious distinction. He wrote of the great need to clearly frame and present the issue of abortion -- just as abolitionists exposed the terrible truth about slavery. And what is the real issue? Reagan asked. “The real question today is not when human life begins,” he wrote, “but What is the value of human life? At the web site Public Discourse, Teresa Collett discusses legislation to prohibit abortions on unborn children who have the ability to feel pain. She replies to common objections to fetal pain legislation including claims that unborn children can't feel pain and is it unconstitutional to protect unborn children from pain. The United States Congress and the state legislatures of Michigan and New Hampshire are considering Pain-Capable Child Protection Acts. These acts would prohibit almost all abortions at twenty weeks post-fertilization and beyond. Five states—Nebraska, Kansas, Oklahoma, Alabama, and Idaho—already have such laws on the books. These laws are premised on the idea that an unborn child's capacity to feel pain, independent of fetal viability, is sufficient to establish the humanity of the child and to sustain a limited prohibition on abortion. Like partial-birth abortion bans, these laws advance public recognition of the unborn child's humanity and should be supported. The Right to Life of Michigan Political Action Committee (RLM-PAC) has joined the National Right to Life Committee Political Action Committee in endorsing Mitt Romney for President of the United States. Right to Life of Michigan is Michigan's largest prolife organization. RLM-PAC Chairman Paul Miller said, "While the primary season can often be divisive, it is time for prolife people to come together and unite behind Mitt Romney to ensure President Barack Obama doesn't spend another four years in the White House. We need a prolife president who is willing to respect and defend the sanctity of human life." Mitt Romney has pledged to support the Hyde Amendment, which prevents certain federal funds from going to pay for abortions, supports the reversal of Roe v. Wade, favors efforts to prohibit abortion providers like Planned Parenthood from receiving federal funding and has promised to appoint judges who follow the Constitution. Since being elected, President Obama has implemented a series of pro-abortion provisions. He rescinded the Mexico City policy, which bars funding to organizations which provide and promote abortion overseas, strongly opposed efforts to defund Planned Parenthood and pushed a health care plan without rules to prevent the subsidization of abortions. Miller said, "Words can hardly describe how important this election is for unborn children and other human beings whose lives aren't deemed valuable by some in our society. Electing a prolife president is priority #1 for the RLM-PAC in 2012." Right to Life of Michigan is a nonpartisan, nonsectarian, nonprofit organization of diverse and caring people united to peacefully protect the precious gift of human life from fertilization to natural death. 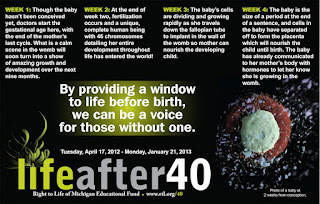 Life After 40 is a Right to Life of Michigan educational outreach for the 40th Memorial of Roe v. Wade and Doe v. Bolton, the two U.S. Supreme Court decisions which legalized abortion through all nine months of pregnancy. Right to Life of Michigan President Barbara Listing said, "After 40 weeks of pregnancy, a baby is born; after 40 years of Roe v. Wade, life begins again. We will be using the 40 weeks leading up to the 40th memorial of Roe as an opportunity to share weekly fetal development facts, encourage involvement in local prolife activities and let people know their prolife involvement is saving lives." Since January 22, 1973, 54 million unborn children have been aborted. Their opportunity for life was taken away. Despite this tragedy, protectors of life have worked for 39 years to save vulnerable members of our human family. Lives have been spared from abortion because of the dedication of prolife people. According to the Michigan Department of Community Health, abortions in Michigan have decreased by 52.5 percent since 1987. 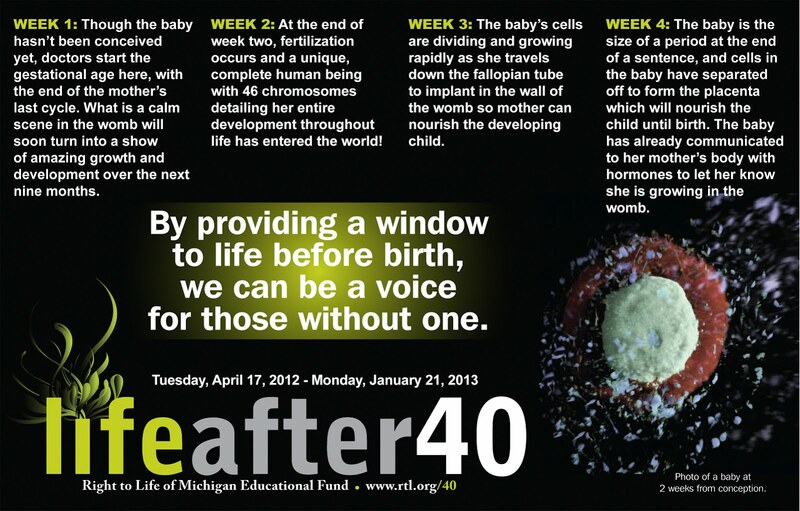 For 40 weeks, from April 17 until the 40th memorial of Roe on January 22, 2013, Right to Life of Michigan is encouraging people to make a pledge to be a voice for the voiceless and share one fact each week about life in the womb. Listing said, "We are excited to have this opportunity to promote not only the miracle of life, but also the sanctity of all human life." Please check out the Life After 40 web page and watch the video below which explains Life After 40. Spring is a time when flowers bloom, the days get longer and birds return. This spring is a time when prolife legislation gets a chance to be voted on in the Michigan legislature. In Michigan, an unprecedented numbers of prolife bills are making their way through the state legislature. After dealing with eight years of former Governor Jennifer Granholm’s veto, prolife legislators are eager to bring their efforts to fruition. In March, the Michigan House voted 72-37 to pass a package of bills designed to prevent women from being coerced into abortion. The lead bill in the package, the Coercive Abortion Prevention Act, creates criminal penalties for actions or threats of violence, financial pressure, withdrawing housing support or employment discrimination. Other bills in the package require that abortion clinics screen for coercion and domestic violence, and then provide appropriate referrals to facilitate an escape from the abusive situation. All abortion clinics also must post a sign informing women of their rights under this law. Also in March, by a vote of 28-10 the Michigan Senate gave final approval to Senate Bill 135, which provides some long‑sought amendments to Michigan's parental consent law for abortion. S.B. 135 is needed to correct two problems: 1.) to prohibit judge shopping and 2.) to institute statewide standards for all judges in determining whether the minor has a legitimate basis for excluding her parents from her pregnancy decision. Right to Life of Michigan also recently released an Abortion Abuses and State Regulator Agency Failure report. The final report culminated months of research and thousands of pages of documents acquired through the Freedom of Information Act. This 52-page report prompted a hearing in the Senate Appropriations Subcommittee on Licensing & Regulatory Affairs. Right to Life of Michigan Legislative Director Ed Rivet testified during the hearing, highlighting how the report documents abortion clinic abuses. Most of Michigan's abortion clinics are not in compliance with dozens of state laws or regulations. The report also cites a vital need for oversight and enforcement on the part of Michigan agencies charged with holding health providers and facilities to account. The history of abortion clinic abuses in Michigan include violations of bio‑hazard waste disposal and medical record privacy laws, negligent operative and post‑operative practices that have resulted in patient injury and death, failure to report abortion complications to the state, failure to ensure sterile, sanitary surgical equipment and sterile operative environment, violations of informed consent for abortion law and the performance of abortions past the point of viability without documentation of maternal health reason. Prolife legislators and Right to Life of Michigan will continue to work together to pass life-saving prolife legislation and shed light on the practices of abortion clinics. For more information about current prolife legislation in Michigan or to read the abortion abuses report, please visit Right to Life of Michigan’s web site at www.rtl.org. On April 12, 2012, the National Right to Life Committee endorsed Mitt Romney for President of the United States. Mitt Romney has taken a strong pro-life position and is committed to implementing policies to protect the unborn, the medically dependent and disabled, and the elderly. Romney opposes abortion and has called the Supreme Court's Roe v. Wade decision, "a big mistake." Romney has expressed his support of the Hyde Amendment, which prohibits the use of federal funds to pay for abortion. University of Michigan declares iPS cell research "the holy grail of personalized medicine"
Presently and for years past, the University of Michigan has been a strong proponent of human embryonic stem cell research and were in favor of Proposal 2, which legalizes the killing of and experimentation on human embryos. While ethical alternatives to killing human embryos have existed for years, the University of Michigan has continued to push human embryonic stem cell research and downplay the ethical alternatives. One of those ethical alternatives is induced pluripotent stem (iPS) cell research. In 2007, researchers discovered they could create cells which behave like embryonic stem cells by reprogramming adult cells. This research doesn't require the destruction of human embryos. Since iPS cells provide an ethical alternative to human embryonic stem cells, proponents of human embryonic stem cells (like the University of Michigan) often minimize the potential of iPS cells because they don't want the public to realize our society doesn't need to kill some human beings in the vague hope of treating others. However, in a recent press release, the University of Michigan let slip how they really feel about iPS cells. After receiving a $1 million donation to study bi-polar disorder using iPS cells, the University of Michigan didn't feel the need to downplay iPS cells. One researcher even called them "the holy grail of personalized medicine." "The research we're doing is opening new avenues to help us understand this devastating condition," says Melvin McInnis, M.D., the Thomas B. and Nancy Upjohn Woodworth Professor of Bipolar Disorder and Depression at the U-M Medical School, the principal investigator of the Prechter Fund, and associate director of the U-M Depression Center. "Soon, someone with bipolar disorder, or any medical disorder, could have their own stem cell lines available to model how their nervous system will react to a specific medication. This is the holy grail of personalized medicine and will radically change the approach to medicine." April is Abortion Recovery Awareness Month. If you or someone you know is suffering from the effects of an abortion, there are resources available. Please click the link below for our page on post-abortion resources. An abortion has more than one victim. The Detroit News has a story about prolife legislation in Michigan which features a number of quotes from Right to Life of Michigan Legislative Director Ed Rivet. In Michigan, about 30 bills have been introduced that Planned Parenthood believes are designed to chip away at women's rights to abortions, contraception and preventive care. Sponsors say the legislation reflects public sentiment against abortions and protecting religious freedoms. Ed Rivet, legislative director of Right to Life of Michigan, said now is "absolutely" the best political climate he's seen for the group's agenda. After the eight years under Gov. Jennifer Granholm and her potential veto of legislation perceived as anti-abortion, he said: "There's been a lot of pent-up demand." Anti-abortion advocates have "earned" the opportunity, he said, through hard-fought gains in legislative majorities and moving public sentiment. "We didn't wake up overnight in November 2010 and suddenly we were in Oz," Rivet said. "We worked our way there." In response to an announcement that Planned Parenthood was opening a clinic in Ferndale, prolifers came out to protest Planned Parenthood and educate the community about America's leading abortion provider. While the clinic in Ferndale will not provide abortions, every Planned Parenthood facility refers women to abortion providers. "When women walk through this door, if they feel desperate, if they feel that they are under pressure in a crisis pregnancy, that's what ultimately Planned Parenthood is going to do, give them an abortion referral," Miller said.